Our K of C Rings are beautifully designed in 10-Kt yellow gold, of massive construction and finest workmanship. Velvet Boxed. 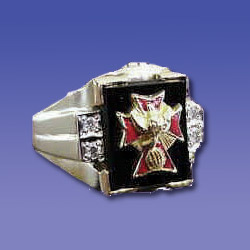 Presented here is a Fourth Degree Ring with Onyx Stone and Diamonds. Ring also available in ruby or blue spinel in place of Onyx. All rings are made to order. Please allow 4-5 weeks for delivery. 14kt. Gold Available.